ISLAMABAD: Former Prime Minister Nawaz Sharif said people have rejected the (Supreme Court’s) decision to oust an elected Prime Minister , he was addressing a rally at Committee Chowk late Wednesday in a defiant show of political power after a last month Supreme Court's verdict that disqualified him from holding any public office over undeclared assets. While addressing a huge crowd gathered to express solidarity with him, former PM nawaz shrif said that People have rejected the [Supreme] court’s decision to oust an elected PM. “That was a court’s decision. 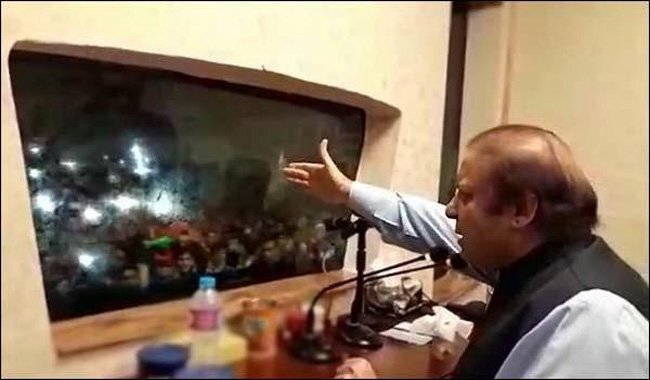 This is the people’s decision”, said Nawaz Sharif at Committee Chowk, Rawalpindi. Former Prime minister Nawaz Sharif has alleged that his government was not allowed to complete the tenure. While casting light on the development works begun in his government, Nawaz said he started economic activities and launched power projects in the country, due to his efforts, load-shedding will finish by next year, adding that it is not acceptable to him (Nawaz) that an elected prime minister by the votes of masses, removed by someone else. He said during the address, "no prime minister in Pakistan has ever been allowed to complete his term , it is an insult to the voters". Sharif asked thousands of supporters to stand up for the "rule of law" and the mandate they had given him. “No corruption case has been proved against me. I have been disqualified for not taking salary from my son,” former PM added. While criticizing his political rivals, including PTI chief Imran Khan, former PM Nawaz asked why Tahir-ul-Qadri had returned to Pakistan. Nawaz said that he will drive the country out of all problems with people support. Nawaz asked the crowd, "would you stand with me for the betterment of the country." Nawaz said Rawalpindi holds a crucial importance in the political arena of the country, adding, “Rawalpindi is my city and I see a revolution here”. According to the schedule, Nawaz Sharif will stay tonight at Punjab House and will leave for Lahore at 11:00 am in the morning. Sharif launched the "caravan" from Islamabad to Lahore despite concerns of close advisers about security for himself and the crowds he is expected to attract. Thousands of supporters thronged the capital to take part in the rally, setting up camps all along the route Sharif was expected to take and address supporters. Sharif was seen off in Islamabad by the new prime minister, Shahid Khaqan Abbasi, the new cabinet and other party officials, said Sharif´s political adviser Asif Kirmani. "We really don´t know how long it will take, how many days, we have no idea," Kirmani told reporters. He said a huge number of people were waiting for Sharif all along the Grand Trunk Road, that runs between the capital Islamabad and Lahore. The caravan took over 12 hours to reach Committee Chowk, Rawalpindi. The rally was started from Punjab House Islamabad at mid-day and entered Faizabad at about 6 pm covering a distance of about nine kilometers and arrived at Committee Chowk, Rawalpindi at 12:10am. The PML-N leader with a massive rally of marchers and others on board vehicles was accorded a warm welcome by a large number of party supporters and leaders including former MNA Hanif Abbasi, provincial Minister for Labour Raja Ashfaq Sarwar, Mayor Rawalpindi Sardar Muhammad Naseem, MPA Raja Hanif advocate, former MPA Ziaullah Shah and others. PML-N leader Daniyal Aziz talking to media said, Nawaz Sharif would address the party workers ahead of Committee Chowk. 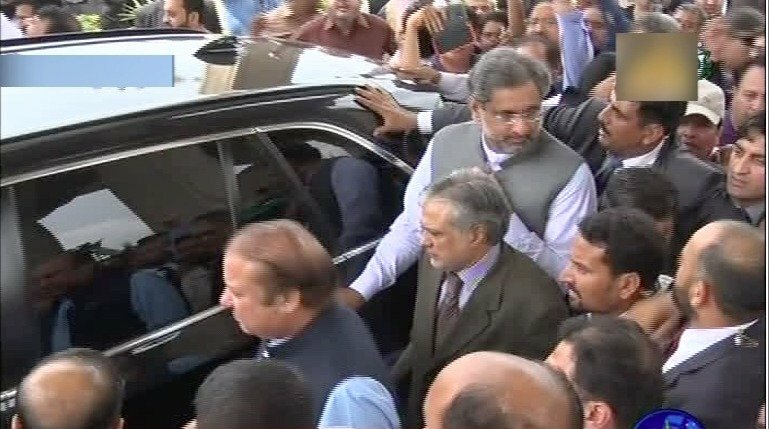 Nawaz Sharif left Punjab House at 11:40 as he waited for the Islamabad High Court verdict in the petitions filed against the rally. The rally moved forward at snail's pace and took hours to reach Rawalpindi where Nawaz Sharif is expected to spend the night at Punjab House. Arrangements are being finalized for his stay overnight, Geo News reported. There were conflicting reports about the number of people attending the rally. Nawaz Sharif will travel some 280 kilometres from Islamabad to Lahore through the GT Road with his cavalcade passing through 15 National Assembly (NA) constituencies to reach NA-120 from where he was elected an MNA in the 2013 general elections.Out of these 15 NA constituencies that fall in the route of the cavalcade, fourteen constituencies were won by the ruling Pakistan Muslim League (PML-N) in the 2013 general elections and only one NA-105 was grabbed by former Punjab chief minister Chaudhry Pervaiz Elahi. Ruling party creating chaos in the capital, distress for citizens in bizarre rally by a government in office. Power play against whom? 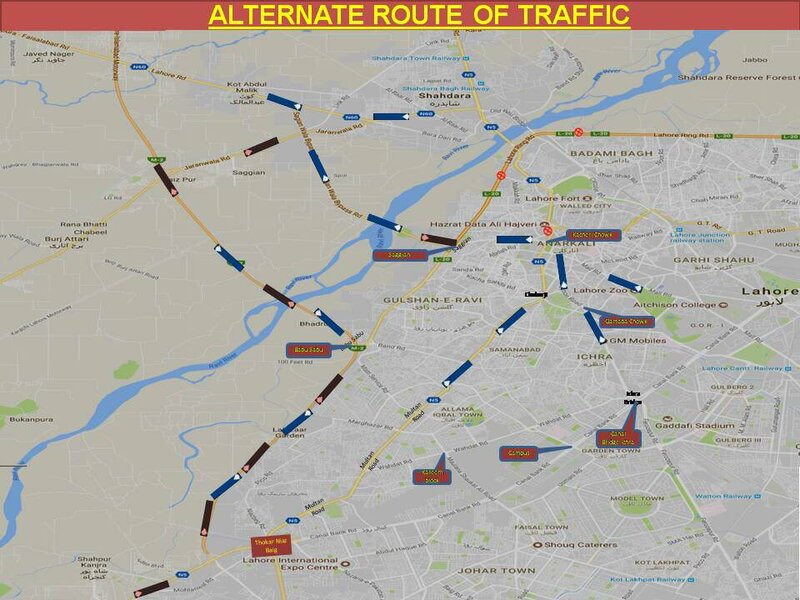 Punjab Government issues alternate traffic route plan for Motorway and GT Road. 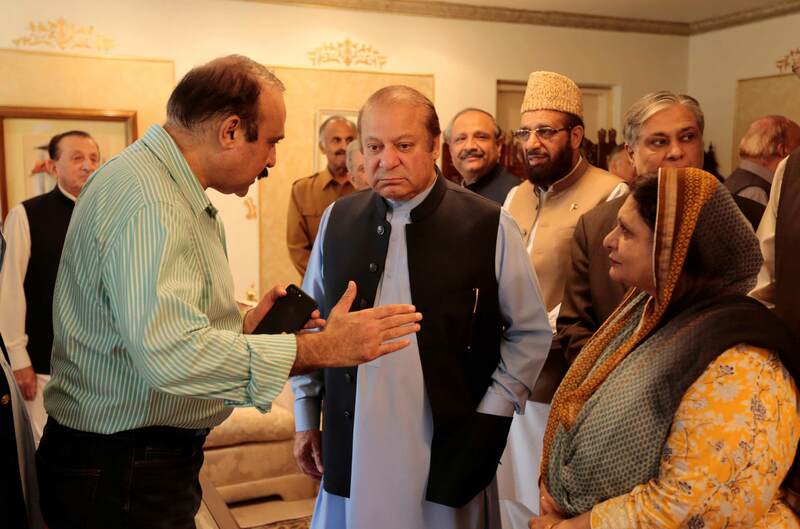 Former prime minister Nawaz Sharif speaks with members of his former cabinet as he prepares to leave Punjab House. The rally would first reach NA-52 (Rawalpindi III) from where former Interior Minister Chaudhry Nisar Ali Khan was elected in the last general elections. Then Nawaz Sharif with his supporters will enter NA-51 (Rawalpindi II), the constituency of Raja Muhammad Javed Ikhlas who is a staunch supporter of the PML-N and the Sharif family. They will further travel towards Gujjar Khan and Sohawa and reach NA-62 (Jhelum I) which is also a stronghold of the PML-N from where Chaudhry Khadim Hussain was elected in 2013. The caravan will cross Dina and Jhelum and move towards Sara-e-Alamgir to enter the area falling in NA-107 (Gujrat-IV). Chaudhry Abid Raza of the PML-N is the MNA in this constituency and a quite active political worker. The cavalcade will then reach NA-106 (Gujrat III), the constituency of Chaudhry Jaffer Iqbal. Then comes the constituency NA-105 (Gujrat II) that is the only one in the route of this caravan from where the candidate from the party other than the PML-N was elected. Former Punjab chief minister Chaudhry Pervaiz Elahi was elected from this constituency in 2013. The political commentators opined that no untoward situation should happen at the time of the arrival of Nawaz Sharif and his supporters in this constituency as the Chaudhry brothers are quite mature politicians and would not create any problems for the participants of the caravan. The caravan would then pass through NA-101 Gujranwala VII (Justice (retd) Iftikhar Ahmad Cheema), NA-97 Gujranwala III (Chaudhry Mehmood Bashir Virk), NA-96 Gujranwala II (Engr. Khurram Dastgir Khan), NA-98 Gujranwala IV (Mian Tariq Mehmood) and NA-99 Gujranwala V (Rana Umar Nazir Khan). It will travel through Sadoke, Muredke and Kala Shah Kaku and reach NA-131 Sheikhupura I (Rana Afzal Hussain) before entering NA-132 Sheikhupura II (Rana Tanvir Hussain). The participants of the caravan will then travel from Ferozwala towards NA-118 Lahore I (Muhammad Riaz Malik) after which it would pass through Shahdara to reach the final destination NA-120 from where Mian Muhammad Nawaz Sharif was elected an MNA and ultimately became the prime minister of Pakistan in 2013.